It’s been a long time since I could claim to have a hi-fi system. While I still own my rather good system (if I may say so myself – I do love that collection of odd but luscious bits), it’s been languishing in a storage locker since July 2014 when I first hit the road on my digital nomad adventure. In that time, most of my music has come from a little Bose Soundlink Colour Bluetooth speaker (reviewed here), or the lo-fi speakers on my MacBook Pro. When I wanted a bit of higher fidelity, I reached for a set of quad-driver in-ear-monitors: either my Sony XBA-4 (reviewed here) or Logitech UE-900s (reviewed here). Frankly, when talking about fidelity, these in-ear-monitors, or earphones if you prefer, are very hi-fi indeed. 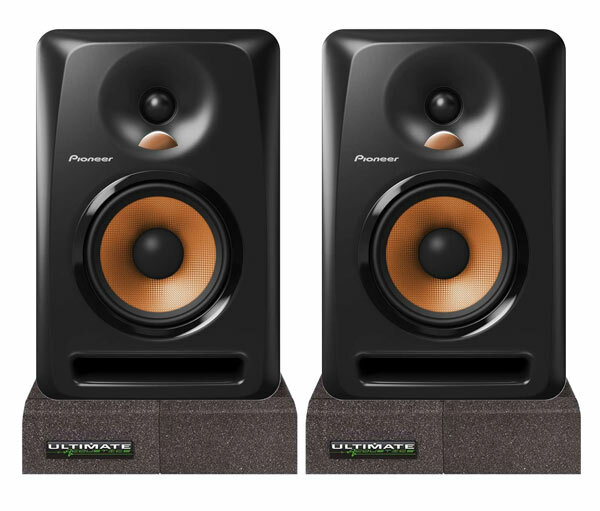 Can a set of these Pioneer Bulit monitors serve as a domestic hi-fi system? But as good as the ‘phones are, and as convenient as the Bose is, it’s all just not the same as having a real stereo system to listen to. Head-Fi is great but sometimes you just want to feel the bass notes, or revel in a wide soundstage. So now that I might be able to stick around one place for more than three months, I’m contemplating getting hold of some hi-fi gear. But the Big Island of Hawaii has the saddest selection of second-hand audio gear I could ever have imagined. Where a look at the audio section of Trade Me back home in New Zealand will get the juices flowing, a glance at the same thing on the local Craigslist site is more likely to get the tears flowing. Kiwi hi-fi lovers don’t know how good they have it. So with local second-hand components seeming to be totally off the menu, and the thought of shipping used gear from the mainland filling me with fear, it looks like I’ll be buying new, albeit at typical USA super special ‘retail’ prices. I’m thinking small, simple, and affordable at this stage. With no CD collection, and no vinyl (both safely housed in the aforementioned locker), my music will be coming from computer, smartphone, and an aged iPod Classic. Which means that in addition to analogue inputs, Bluetooth and USB connectivity would be very nice indeed. The first bits that seemed to make sense was a NAD D3020 integrated amp (reviewed here) and a set of Cambridge Audio’s Aero 2 standmount speakers (reviewed here). Throw in some basic speaker cable and I’d be good to go. Having lived with both pieces of kit in the past for a good long while, I’m confident that I’d be getting sound quality that I’d really enjoy without breaking the bank. In fact, I could get the whole lot delivered for under US$700. So what’s stopping me pulling the pin and handing over my credit card details? Well, I’ve always wanted to try a set of studio monitors. The idea of having most of the money spent on the performance, and very little on the aesthetics of the equipment makes a lot of sense. After all, that’s how Golden Ear Technologies get that delicious, paradigm-shifting bang for bucks ratio in the Triton series loudspeakers. Forget the fancy veneered cabinet, let’s just whack a black sock over the speaker and spend all the loot on the bits that make the noise. Indeed, they are built for different purposes, one for enjoying music, the other for critiquing the recording. So only your ears are going to be able to tell you which one you’d prefer. Good luck!